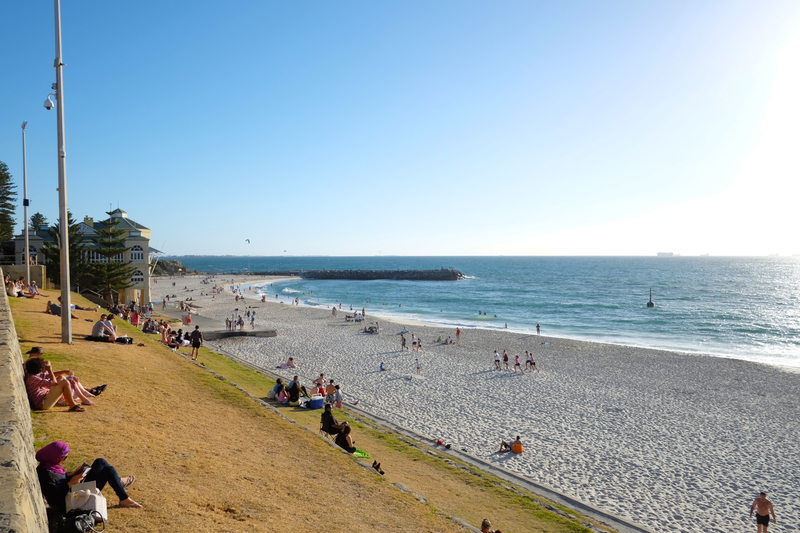 Cottesloe Beach. Yes, it really is that gorgeous nearly every day. I spent some formative years in Perth, Western Australia and recently returned for a visit with the family in tow. Here are five tips for a more enjoyable stay in the beautiful city. 1. Stay in an apartment by the beach. Apartment style accommodation is a great option for families, providing all those amenities to make a ‘home away from home.’ It is made awesome by choosing an apartment by the beach in Perth. The beaches are some of the biggest drawcards of this gorgeous city. Generally, in the Perth climate, it is best to visit the beach in the morning. The afternoon brings in the famous “Fremantle Doctor” sea breeze which can blast sand into children’s faces and make the surf uncomfortably choppy. Also, in the warmer months, later in the day it can be just too hot to enjoy. If you are staying near the beach, there is no travelling time and you can wander home to your own shower and fresh clothes. A play in the sand and a splash in the ocean is a great way to start the day and with the short commute you will have plenty of time left in the day to enjoy other sites. It’s also something great to return to at the end of the day, the sun sets into the sea and there is not always a strong sea breeze (but almost always). 2. Perth is a city designed for cars. I will admit, in recent years access to good public transport in Perth has greatly improved. However, it is still a pretty spread out city and with children I think it is so much easier to get around with a car. Also, if you are visiting during the warmer months short rides in the air-conditioned comfort of a car can be a refreshing reprieve to help you carry on through your day. 3. Cheap eats require some homework. Perth is has a well-founded reputation for expensive dining. I suggest using an app/website like Urbanspoon to seek out more affordable options and family-orientated dining. There are some fantastic restaurants if you feel like treating yourself and your crew. The vibe of many places is sophisticated, but casual. So you can feel comfortable bringing children and enjoying some lovely food. 4. People get going early in Perth. While in many cities of the world shops don’t open until 10 am, in Perth you will definitely see people doing their grocery run by 9 am. Recent deregulation of shopping hours will probably see some changes to this, but there is undoubtedly an early-bird culture in Perth. People will think nothing of inviting you to breakfast at 8 am on the weekend. It may also be a function of the hot weather that Perth has over the Summer months. As a result, traffic can get nasty pretty early in the day, even on the weekend, so you need to factor that in when planning your touring. 5. Traffic is just different. I’ve just mentioned how the early starts affect traffic, but that’s not all. If you’ve driven in several cities, you’ll probably be aware that there is often a particular driving culture associated with a city. I would describe Perth drivers as generally aggressive. Merging lanes can become the scene of impromptu drag races, with drivers racing each other to be in front before two becomes one. Other things to look out for are sudden turning without indication and mild tail-gating. The biggest concern is the lack of awareness of pedestrians. This is probably due to the fact there aren’t as many pedestrians as you would come across in more densely populated cities like Sydney and Melbourne. While in Sydney and Melbourne it is not uncommon for people to dart through the relatively slow-moving traffic, racing to catch a tram or the like, in Perth I suggest you always ‘stop, look and listen.’ This even applies at zebra and controlled crossings. 2 kids + carry-on only = madness? Perhaps now they’ve finally deregulated the shopping hours we’ll get there. That would have definitely been a culture shock!